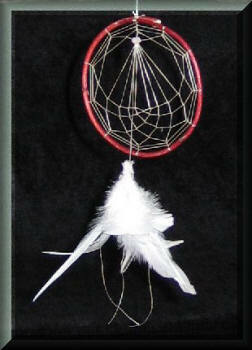 The Lotus Dream Catcher tell us that the lotus is portrayed by the cultures of many lands as a symbol of purity. Arising from the muck, it inspires all who see it. In poems, paintings sculptures, and legends from China, India, Egypt, the Lotus inspires mankind to follow its example to open up to beauty and light. In Buddhism, the flower symbolizes faithfulness, trustworthiness. Becoming Buddha-like is the highest ideal. Out of the muck the lotus springs forth pure and beautiful, much as the Buddhas free themselves from worldly worries. The golden lotus has two meanings, the achievement of enlightenment and the real flower that is beyond our normal perception. The plants stalk bending but not breaking, represents a close unbreakable bond between two lovers or the members of a family, showing that no matter how far apart they might live, nothing can really separate them in heart. The root and flower are one, in which the flower draws nourishment from the mud, but rises above its environment and shines. Apart from pursuing inner cultivation, meditation and deep thought, experiencing is also a form of cultivation, for it tests one’s ability to experience but not being caught in the experience.